And check out OUR NEWLY LISTED ITEMS. 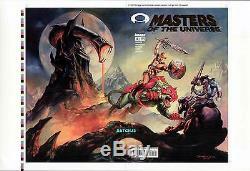 This is an original printed cover proof for Masters Of The Universe #4. This is a full-color uncut and unstapled proof of the cover, including both the front and back covers, and with printing on both sides of the covers, the same way it looks in the published comic. The proof is on high-quality glossy cardstock, and measures approximately 11 1/2" by 17". You can see printer color code bars and symbols along the left side edge. It features an awesome image of He-Man riding Battle Cat, about to charge the evil villain Skeletor on Panthor, as they both raise their swords near Snake Mountain, with artwork by the legendary painter Boris Vallejo and the brilliant Julie Bell. Don't miss out on a chance to get a very cool and rare comic collectible that you will hardly ever get a chance to see. This is an outstanding piece of comic production art, that would look great framed, and would be a fantastic addition to any collection. Check out our other auctions for more great items. Check it out, you'll be glad you did! The item "BORIS VALLEJO & JULIE BELL HE-MAN MOTU #4 ORIGINAL PRODUCTION ART COVER PROOF" is in sale since Wednesday, March 19, 2014. This item is in the category "Collectibles\Comics\Original Comic Art\Covers". The seller is "satchj3" and is located in Brooklyn, New York. This item can be shipped worldwide.